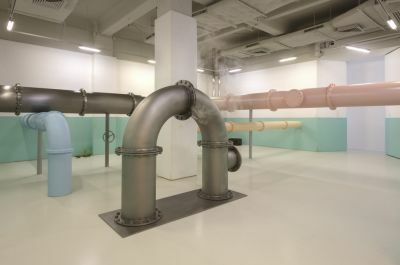 Elmgreen & Dragset’s solo exhibition Overheated transforms Massimo De Carlo’s third-floor gallery in Hong Kong into a different setting: an abandoned, underground boiler room. Continuing the artist duo’s practice of altering art spaces into other kinds of environments, Elmgreen & Dragset once again turn the white cube into a location not normally frequented by fine art audiences. Industrial tubes of various sizes and colors crisscross throughout the space, re-directing the visitors’ movements into new patterns as they will have to step over, bend under, or walk around the large tubes in order to navigate the site. The materiality of this installation makes visitors aware of their bodily presence in relation to the architecture. Aesthetically, the installation draws on early Minimalist and conceptual works by artists such as Michael Asher and Charlotte Posenenske, and it recalls the externalization of the architecture of Paris’ Centre Pompidou. The metal tubes – punctuated by equidistant bands of industrial-style rivets – appear as if they were penetrating the floor, walls, and support columns, creating the illusion of some sort of functionality and seemingly extending beyond the physical features of the gallery space itself. The installation highlights the gallery’s existing and exposed ventilation system, which is hanging from the ceiling – and, like other works by Elmgreen & Dragset, it puts on display what is usually meant to go un-noticed. Much like the unseen labor that goes into our drainage and heating systems – labor that is invisible for most but essential for our daily comfort – it is important to remember that the art world is also dependent on a huge and most often uncredited work force of manual labor in order to function. Within this vast installation, one will also experience a number of sculptural works by Elmgreen & Dragset that imply traces of human activities with ambiguous narratives: one could imagine these works relating to the past actions of a potential caretaker or being associated with some person who has been using this abandoned space as a temporary living quarter. Amongst these works are a leftover black car seat cast in bronze and a burned-down candle carved in marble on top of a bronze cast of a small wooden crate used as a substitute for a table. The works might look like simple ready-mades at first glance, but they are all carefully crafted sculptures. In a corner, a pile of Autumn leaves, made of metal and hand painted, underlines the idea of a bygone time. Overheated engages with the context of Hong Kong, a city once recognized as a major manufacturing center for goods and products but today more well-known as a financial center and an art market hub. Just as production that previously took place in Hong Kong has shifted elsewhere, the physicality of manufacturing has become increasingly estranged from many people’s everyday realities. Even the meaning of the term “boiler room” has changed: its initial reference to a room in a residential building, a factory, or a ship containing a boiler and related heating equipment now more commonly pertains to event venues with club nights and DJ sets or spa facilities, or an office in which operators engage in high-pressure scam telephone calls – activities that do not involve any sort of industrial machinery or physical labor. Similarly, the last decades have seen the re-appropriation of former industrial factories or buildings into trendy restaurants, shops, lofts, or artists’ studios. In a complex interplay of past and present, Overheated puts a focus on the shifting cultural dynamics of our recent history. Based in Berlin, Michael Elmgreen (b. 1961, Denmark) and Ingar Dragset (b. 1969, Norway) have worked together as an artist duo since 1995. Elmgreen & Dragset have had solo exhibitions in prominent institutions worldwide, including: This Is How We Bite Our Tongue, Whitechapel Gallery, London (2018); Die Zugezogenen, Museum Haus Lange, Kunstmuseen Krefeld (2017); Changing Subjects, The FLAG Art Foundation, New York (2016); Van Gogh’s Ear, Rockefeller Center, Public Art Fund, New York (2016); Powerless Structures, Tel Aviv Museum of Art, Tel Aviv (2016); The Well Fair, Ullens Center for Contemporary Art, Beijing (2016); Aéroport Mille Plateaux, PLATEAU, Samsung Museum of Art, Seoul (2015); Biography, Statens Museum for Kunst, Copenhagen (2014); Biography, Astrup Fearnley Museet, Oslo (2014); Tomorrow, Victoria and Albert Museum, London (2013); The One and The Many, Museum Boijmans Van Beuningen, Rotterdam (2011). Their group exhibitions include: Like Life: Sculpture, Color, and the Body, The Met Breuer, New York (2018); WAITING. Between Power and Possibility, Hamburger Kunsthalle, Hamburg (2017); Slip of the Tongue, Punta Della Dogana, Venice (2015); Panorama, High Line Art, New York (2015); GOLD, Bass Museum of Art, Miami (2014); Do it Moscow, Garage Museum of Contemporary Art, Moscow (2014). They have also taken part in the Bangkok (2018), Istanbul (2013, 2011, 2001), Liverpool (2012), Performa 11 (New York, 2011), Singapore (2011), Moscow (2011, 2007), Venice (2009, 2003), Gwangju (2006, 2002), São Paulo (2002), and Berlin (1998) biennials as well as the Yokohama Triennale in 2008 in Japan. Elmgreen & Dragset were appointed curators of the 15th Istanbul Biennial (2017). They were awarded a Special Mention at the 53rd Venice Biennale (2009) for The Collectors at the Danish and Nordic Pavilions and won the prestigious Preis der Nationalgalerie für Junge Kunst at Hamburger Bahnhof in Berlin (2002).